I Do. You Do. We Do. When you budget with a partner, your budget – your shared budget – is one of the keys to achieving long-term happiness. Here’s the truth: You are merging your life with your partner’s. And that’s really what this Guide is about – those partnerships where you’ve decided that this is it. This is for real. For life. This commitment in and of itself requires a measure of compromise and new ways of managing your life. Whether you have realized it yet or not, your priorities have changed. This isn’t the same as budgeting on your own. You now share your priorities with someone else (or with each other, if you are reading this together, in which case, bonus points!). A budget gives you shared ground and a safe, productive way to talk about those shared priorities. Every relationship is different, and it’s important that you give yourselves time to refine exactly how a shared budget will work for you. You might find that it takes you a bit of time, some trial and error, and lots of communication. That’s okay. You’ve got your whole lives ahead of you. You’ll find your rhythm and it will be well worth the investment. Of course, just like your relationship is unique, the way you budget together will be all your own, too. But you don’t have to figure this all out from scratch. There are some tested truths that might spare you a few missteps and gotchas. Each of you needs to reflect on and share your personal history and relationship with money. It’s important to talk about your challenges, your expectations, your goals – all of it. And you’ll need to keep talking about it in regular budget meetings. Then keep it simple and sustainable with joint accounts and shared understanding about financial roles and responsibilities in your relationship. First, though, you’ve got to talk through the three different sets of priorities in your two-person relationship. When you’re budgeting by yourself, the idea that a budget is simply a representation of your priorities is fairly simple; there’s only one set of priorities – your own. In your relationship, though, there are three sets of priorities. Yes, three. There is a great opportunity here, not just to budget well, but also to increase the effectiveness of communication in your relationship by regularly discussing these three sets of priorities. There’s also a lot of room for mistakes, most of which happen when you make assumptions about those priorities. Assuming that mine is the same as ours can cause problems. So can assuming that mine is more important than ours. Or that mine will always somehow be trumped by ours. You’re probably a little too familiar with one of these. Your shared budget. And lots of communication. While there may be three different sets of priorities in your relationship, there’s just one pool of money. Deciding how much money should go toward which priorities becomes very complex when you’re looking at only one part of that pool at a time. When you see all your money together in your shared budget, you’re making decisions together about all of it. This leaves much less room for assumptions and second guessing. Much less room for wondering how mine goes with ours. Because it’s all right there. As far as communication goes, there are two really important moments that can make or break a shared budget: laying it all out at the outset, and holding a regular budget meeting every month after that. When it comes to sharing finances with a partner, you don’t come empty-handed. You bring money habits and notions about money that may be different from your partner’s. And, well, you bring money. Or a lack thereof. 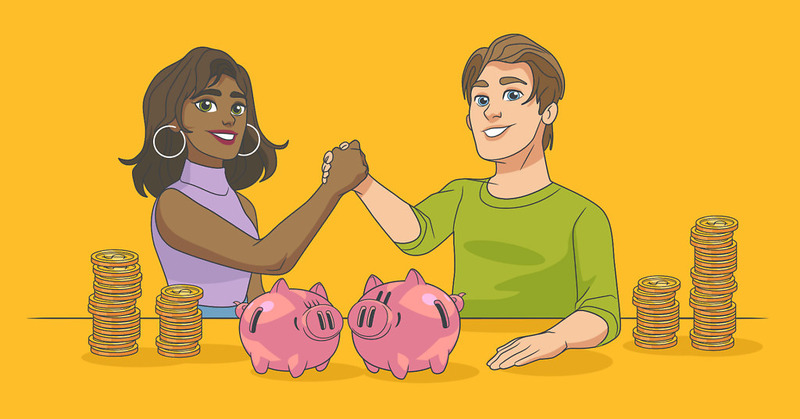 When you begin budgeting with your partner, take the time to sit down and share all that you are bringing to the table – the good, the bad, the ugly. Even the embarrassing. This will be some of the most important time you spend together. You and your partner have different habits about making dinner, doing laundry, and how to handle the toothpaste cap. Why would money be any different? Some habits are related directly to money. Do you pay your bills as you receive them? All at once in a stack? Do you always save a portion of each paycheck for retirement, or use a certain percentage for tithing? Some habits are more about how you live your life, but directly affect money. Is Friday night always for eating out? Does your partner wash his car twice a week (seriously, who does that)? Do you have a hobby (an expensive one) your partner just doesn’t understand? Your lists could be quite long. You don’t need to discover every last thing before you begin budgeting together (you might not even be aware of it all yet), but the more you uncover and share, the more ready you’ll be. You don’t just have different behavior when it comes to money. You have different ideas about money. One of you views debt as the ultimate evil, the other as a useful tool to get what you want quickly. One of you enjoys seeing how long you can go without spending the last $5 in your pocket, while the other views spending as entertainment. Just like your habits, you may not be able to uncover all of these right off the bat. But sharing what you do know, and being open to the rest as it comes, will set you up for success. You may come to the relationship with good old-fashioned money issues. Like a pile of debt. Or even a pile of money (yes, that can be an issue, too). Or a job that doesn’t pay as well as it should. Or an impending (large) expense like graduate school. Especially if your particular issue of choice involves debt, you might be tempted to minimize it. But that isn’t going to work. It will only make it worse in the long run. Now is your chance to lay it all out on the table. The more information you share, the more you can share in making good decisions about your shared future. If you don’t each have all the information, you might think differently about what would make good decisions. You might have completely different ideas about priorities. Instead, lay it all out on the table. And keep talking. And budgeting. And budgeting and talking. They go together. A Budget Meeting. Or a Date. You’ve talked about yours, mine, and ours. You’ve shared your habits, your perceptions and expectations about money, and all the financial complications, good and bad, that you bring to the relationship. You’re heading into shared budgeting with great momentum. Budgeting together means being clear about your priorities. If you’re going to give every dollar a job together, it deserves your full attention, not just a passing five minutes in the morning before work. How is your spending trending compared to what you budgeted? Are you getting close to using all the money you gave to a certain job? Did you have overspending that you need to deal with using Rule Three? Where will that money come from? Have things come up in your budget that neither of you expected? How will you handle them now and anticipate them in the future? Is your current budget pointing to adjustments you might need to make next month? Are there unusual events happening in the coming month that you need to prepare for? Are you on track with your long-term goals? If not, do you need to adjust your habits? Or adjust the goal? You’re grownups, you can talk about whatever you like. But you need to have a budget meeting. But budgeting doesn’t have to be boring. Make it a date. Budget some money (of course) for a dinner out or a pizza in, and make that your budget meeting. In the summer, find a coffeeshop with WiFi, sit outside and talk about what your date budget will be next month. And how much you love each other. All of that. Whatever works for you two. The point is, without a meeting, there’s every chance that two out of three of your priorities (yours, mine, and ours) won’t get enough attention. Not because you or your partner are selfish or manipulative. It is just natural that if one person is doing all the budgeting, the budget is going to be viewed through that person’s eyes. There’s too much room for misunderstanding. Too much room for dollars to be misaligned from priorities. What if you forget to communicate? (It can happen. We get it.) It’s never too late. It’s one of the hidden benefits of your budget’s flexibility. When you give every dollar a job, it is not written in stone. If you talk about wanting to make a change, go ahead. Just as Rule Three helps you roll with the punches, it can help you adjust when you forgot to or didn’t have time to plan together. And you thought budgeting wasn’t romantic … Just you wait, this is going to be your favorite night of the month! You’ve made a commitment to each other. You’ve turned budget meetings into your favorite dates. You’ve joined your lives. And your toothpaste, and your mismatched furniture collections, and your books, and your music. You ought to join your checking accounts, too. If you’re hesitant, you’re not alone. Lots of couples have three checking accounts (or even more) – one joint account and two individual accounts. That sounds an awful lot like separating money by yours, mine, and ours, so you might be thinking it’s a good idea. But that’s just your money and its locations, not your priorities. Separating money into different accounts can subtly change the focus of yours, mine, and ours. Instead of thinking about your priorities, your focus turns to money itself. As in your money, my money, and our money. Questions about priorities remain unanswered, and you end up in complex machinations about which money goes where. Does my paycheck all go to my account? How much goes in our account? What if your paycheck is three times the size of mine – do we follow the same rule? And that’s just when the money is coming in. The complexity triples when it comes time to spend it. Imagine (or maybe you don’t have to) a trip to the store involving something that’s mine and something that’s yours – which debit card do you use? Is it my priority, so we should use my account? Or is it ours, so we should use our account? Do this long enough (like, more than a day), and you’ll find valuable energy going toward payment method instead of priority. When the discussion of yours, mine, and ours revolves around priorities, however, you’ll quickly find that the location of your money isn’t important. Now here’s the most important shift: the source of your money or who makes how much isn’t important either. Your paychecks and your partner’s get poured into one budget, and by laying it all on the table, your discussion of yours, mine, and our priorities removes the need for anything artificial like separate accounts. With this shared budget, you assign the dollars to different jobs, regardless of their original source. Still want some space for a little bit of my money and your money? Absolutely. Inside of a shared budget, it’s a great choice. Budget some money each month for fun money that each of you can save or blow thoughtlessly without answering to the budget – or to each other. You’ve got a shared budget. Keep it simple and have a shared account. Then, you can just focus on decision-making. Together. You’re in this together. You’ve joined your budget and your accounts. But that doesn’t mean you can’t be efficient. Sharing your priorities and budgeting with a partner means doubling your budgeting joy. It shouldn’t mean doubling the time and effort you spend managing it. When you receive new income, will one partner be responsible for initially budgeting that money? Or will you sit down to do it together? If you overspend and need to re-prioritize with Rule Three, will one of you make those decisions? Do you have a shared idea about which of your priorities might have to take a back seat when overspending happens? Who’s going to take care of the nitty-gritty – things like coordinating your bill payment through your bank and reconciling your accounts to make sure that your data is always accurate? Deciding these things ahead of time has two significant benefits. Clarity about these questions keeps your budgeting simple – and we think that’s incredibly important, since keeping it simple keeps you focused on what’s important, like clarifying your priorities and reaching your goals. The other benefit has nothing to do with your budget. (But we’re going there anyway!) You’ll be a happier, better couple. Every time you communicate in this way about your finances and budget, you remove an obstacle in your relationship. It’s not uncommon to have misunderstandings about money. But with a shared budget, clarity on priorities, and yes, clarity on simply who’s doing what, it’s much less likely to happen. Budgeting bliss. Together. It’s closer than you think.